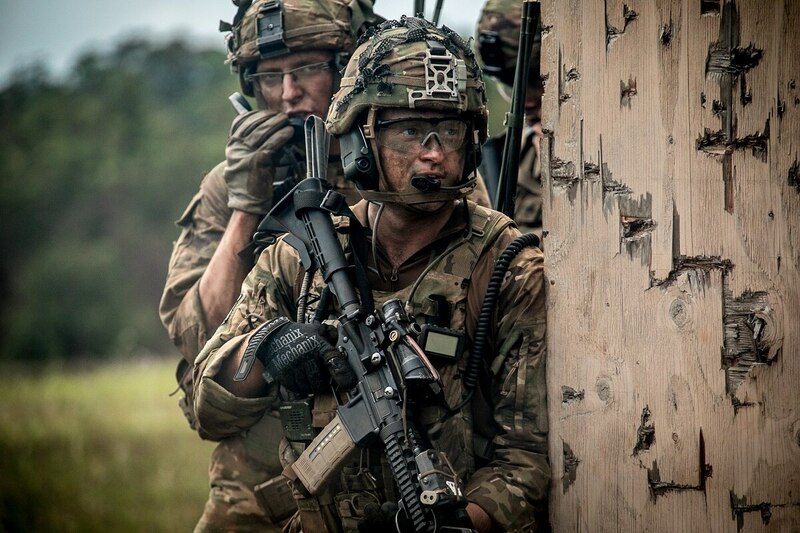 Members of a task force focused on grunts and special operations troops are finding ways to make infantry a top choice and not a last resort for entry-level recruits. To that end, they have visited the Israeli Defense Force, the 75th Ranger Regiment, the Army’s major combat training centers, the Army’s Infantry School and the Marine Corps’ combined arms training center to find the best practices for finding, recruiting, retaining and training a transformed light infantry. Army Sgt. Maj. Jason Wilson, the senior enlisted adviser to the Close Combat Lethality Task Force, briefed media at the Pentagon this week on some of the early initiatives of the task force since it was formed in March. Wilson, a career infantryman, broke down how the task force is bringing ideas, equipment and analysis to Secretary of Defense Jim Mattis, the task force’s creator, to make the infantry more lethal and able to “overmatch” any “pacing threats” it might soon face. While details were scant in the briefing, Wilson did highlight the evaluations the team has done as a first step toward presenting some of the first major changes to how the Army, Marine Corps and Special Operations Command build the fighting force that does close-in killing and disproportionately suffers the greatest losses in combat. “We want to get away from our close combat forces being the place where soldiers that don’t meet the requisite criteria to be an intel analyst or whatever, get sent to,” Wilson said. To that aim, they want to identify troops early in their military careers to see if they have the potential to be in the infantry. And it goes beyond ASVAB and physical fitness scores. “Do they have the resilience and mental capacity to handle some of the things they may see in the infantry, be able to overcome that adversity and bounce back?” he said. The battle is seen as a preview of the future of small-unit fighting. And once they’ve got the best candidates, they must train them realistically and keep them in the close combat ranks. On that front, the task force is looking to advanced gaming technologies and combined areas of live, virtual and constructed and synthetic capabilities. The goal is for soldiers, Marines and special operators to first be able to run through combat scenarios in virtual environments from anywhere, whether at home station, aboard ship or in other training areas. That will expand to include the ability to combine synthetic environments with real-world training. And this effort goes beyond training for a handful of soldiers — the goal is to have an entire brigade combat team linked in the virtual world to conduct a training exercise, Wilson said.